Isola's always seen things other people haven't, especially in the woods. Nothing's ever bothered her until she finds the dead girl in the bird cage. Instead of leaving her alone, the girl follows her home and threatens her. Isola's friends try to protect her, but she must find the reason behind the girl haunting her before the threats become real. 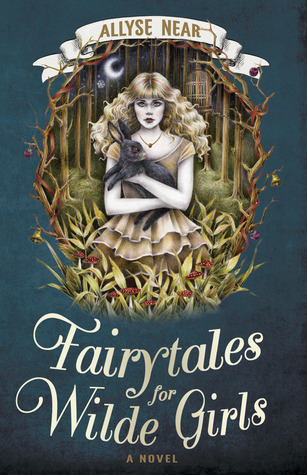 The contents within Fairytales for Wilde Girls is as beautiful as its cover. I thoroughly enjoyed Allyse Near's writing, which made me feel like I was transported into a magical world. It had both a very whimsical and innocent feel, but also carried a dark and mysterious tone. These elements together displayed what I found to be the perfect example of a fairytale; mirroring something like the Grimm's brothers tales. I liked the underlying creepiness, delivered subtly, and kept me on edge. The mystery surprisingly had a lot more depth than the usual fantasy/supernatural stories. At times it did drag on a little, but the pace was quick and intense that I flew through it pretty easily - after two tries that is, but don't worry because once the plot reached its conflict it captivated me instantly. What I loved was that each character had their own voice, making them identifiable and memorable. I also loved that the two characters, Isola and Edgar, were named after popular historical figures. Their personalities are influenced by the previous Isola Wilde and Edgar Allen Poe. However, my favourites would have to be the magical creatures who circulate Isola and protect her. Each one of them were fascinating in characteristics and appearance. In fact the book also has illustrations of each character and they look absolutely stunning! The ending was heartbreaking and nothing I ever expected. It carried a deep and heartwarming message, which I appreciated. Fairytales for Wilde Girls is a clever story, combining elements of fantasy and mystery along with relatable themes such as relationships amongst friends and family, trust and loyalty. Give it a read! "And they lived ever after, whether they were happy about it or not"